You have researched the Lagotto to determine if this breed would be a good match for you and your family and you are now ready to take the next step. As a family or individual looking for your next family member you may find this can be an exciting and often daunting task and one in which you have no idea where to start. We hope to provide you with some guidelines and questions to ask potential breeders and explain why these questions are important. The most important piece of advice that can be given is to “choose your breeder, not the puppy”. You will fall in love with any puppy – that is a guarantee. But, a life with a dog that is not healthy or has a poor temperament will cost you time, money and a lot of heartbreak. What health testing is done prior to breeding? May I see those test results? Are you a member of the Lagotto Romagnolo Club of America? In not, why? How long have you been a breeder? How long have you been breeding the Lagotti? How many litters do you have a year and how do you decide on the particular breeding? Will a puppy be chosen for me? If so, how do you make that decision? What activities do you participate in with your dogs to ensure they are evaluated from an outside source? Do you have a contract and does it offer a health guarantee? Can I see your terms before I commit to a puppy? Do you require a deposit to be placed on a waiting list? If so, is it refundable if I change my mind or if a planned litter is not produced? Will I be provided with an AKC registration application upon receipt of my puppy? Will the puppy be required to be spayed or neutered? Do your puppies have a health check by a veterinarian, vaccinations, microchip and worming? Will I be provided with documentation? What are your practices for raising puppies to provide socialization and enrichment? Will you provide me with written instructions on feeding, care, training and grooming? You may be asking why some of these questions are pertinent to ask a breeder. Your goal is to find the breeder that will provide you with the best chances of getting a healthy and temperamentally sound dog that conforms to the aspects that attracted you to the breed in the first place. You should want a breeder that will be there in the future to answer questions and concerns you may have about your puppy/dog and one that stands behind their puppies. You should also want a dedicated breeder that possesses years of experiences and knowledge so your puppy will be the result of careful planning. Only then can a breeder offer you the predictability and consistency of quality in health and temperament from their breedings. There is only one parent club accepted by the American Kennel Club per breed, for the Lagotto Romagnolo, it is the Lagotto Romagnolo Club of America. Being a breeder in good standing with the club shows the breeder has agreed to the Code of Ethics for membership and for breeding. If they are not a member, what guidelines are they following in their breeding practices? If they are not a member, the reason could be a refusal of the breeder to abide by the LRCA’s Code of Ethics or the Club’s refusal to accept this individual as a member due to past practices. If a person is breeding you would expect them to be contributors to their breed club; if not, ask why they chose not to be a part of the AKC’s parent club. A responsible breeder most likely will be deeply involved in their breed in ways other than just breeding. This involvement could be serving their breed club in various capacities to competing in dog sports and competitions to conformation events. Participating in events shows the breeder is dedicated enough to spend the time and effort to promote their breed to the public in a positive way. It also verifies their dogs are sound in conformation and temperament so they are not stuck in a “vacuum of kennel blindness”, or in other words, not seeing the faults in their own dogs. Through their participation in their breed club and other activities it will keep them current on health and temperament issues affecting their breed. If you are able to visit a reputable breeder’s home, you will see they have a serious commitment to the breed. You will see a large amount of supplies and equipment in order to properly care for their dogs and puppies. You will often find numerous plaques, ribbons and awards for their participation in various activities. It is important when planning to purchase a puppy that you select a breeder who has performed health testing on the prospective dam and stud. While it is impossible to ensure that your puppy won’t encounter health issues in their lifetime, there are many diagnostic tests for common and breed specific health issues. A detailed explanation of these can be found here. The LRCA has established a baseline set of disorders that it requires breeders to test for and a certification program to show that their dogs have completed those tests. Once all testing results for a dog are submitted, the Canine Health Information Center – CHIC – issues a certificate and a number for the dog. A detailed explanation of the CHIC program can be found here. The LRCA breeder listing page includes only breeders who have paid a listing fee and completed the CHIC certification on their breeding dogs. Breeders who are not listed should provide you with details on their health testing and may also have CHIC certifications. Click here to go to the breeder listing page. Next is to ask a breeder how they decide on which two dogs they will breed to show the breeder’s depth of knowledge of pedigrees, their reasons for breeding and their understanding of the health issues directly related to the Lagotto. All of these considerations are important and contribute to the health and well-being of the puppies they will produce. Not all dogs should be bred and dogs with major faults that clearly are not breeding quality should not be bred. Are they breeding their one male to their female or group of females? Ask why. A serious breeder will be just as concerned about you as a potential owner as you should be about them as the breeder. Have they asked you about your lifestyle, the home you will provide, and your experiences with past pets? A breeder who does, has the puppy’s best interest at heart and their only goal is to find the right match for their puppies. They are not offering you a puppy before getting answers to these questions. A returned puppy is a traumatic experience for all parties involved, therefore they will try to verify you are a good match for the breed and their puppy. 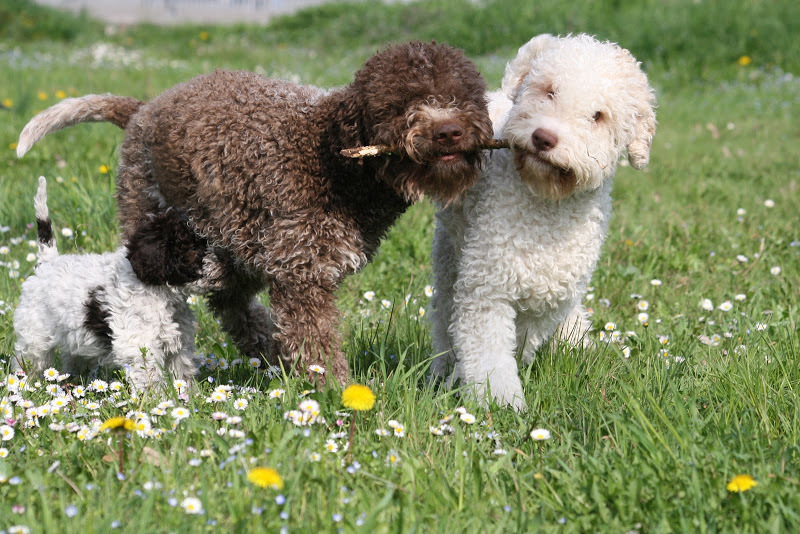 A breeder that has been working hard to develop a sound line of dogs will likely require you to spay or neuter your Lagotto. If you are expected to breed your female in order to give the breeder puppies back, this too is a red flag. A pet should be enjoyed as such and should not be expected to breed. If you are interested in a show or breeding dog be prepared to work closely with your breeder and meet the breeder’s requirements in order to breed your Lagotto. 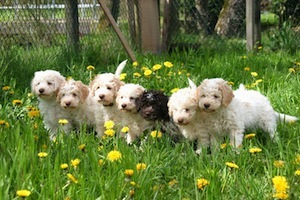 This is expected from a breeder that cares about the future of the Lagotto as well as the future of their puppies. You will want to know the extent of a breeder’s knowledge and experience in how they raise their litters for maximum socialization and enrichment. It is most desirable that the puppies are kept in a busy room in the breeder’s home, not in barns or garages. Puppies need constant mental, physical, environmental and social stimulation as they develop. Dr. Carmen Battaglia, in his study called “Breeding Better Dogs” cites various research articles on this very topic. (http://breedingbetterdogs.com) Breeders need to expose puppies from early ages to all kinds of noises, sights, people, textures, surfaces, etc., and also to everyday activities, sights and sounds of a household. If the breeder has not successfully done their part to enrich and socialize a puppy, then the puppy is at a disadvantage to mature into a self-confident and well-adjusted adult as the critical time period in the puppy’s development has passed and can’t be repeated. Are there plenty of opportunities for the puppies to be socialized and enriched? If you are not able to visit prior to committing to a puppy ask questions and be a good investigator. Before making a commitment to a breeder, you will also want to have an understanding of the terms of their contract and what guarantee they will offer if there is a health issue. Expect to sign a written contract or agreement which offers a clear understanding of obligations for both the breeder and you. Be certain you are comfortable with your options if a problem were to occur. A signed copy should be provided to each party. 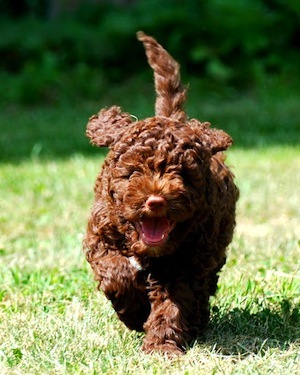 You should also expect to receive written instructions on feeding, care, training and grooming of your new Lagotto. The breeder should always be a resource for any person purchasing from them, for the life of the dog. This is a long term relationship that owners and breeders will forge and keeping that open line of communication is expected. Being a breeder that is doing all they can to produce quality puppies is a boatload of work – “breeding is not for wimps”. Those that try to cut corners or deceive new owners with false promises and pretenses will always exist. If puppy buyers don’t inquire about the above topics, then the breeders need to take the initiative and walk them through the questions and answers to make an informed and educated decision.